Your selection from the kid rug collection can be used to designate a warm, comfortable setting to meet your special needs. Whether your school, church, home or agency needs a cozy reading corner with books on the floor, a homemaking center with shelves, lamp and rocking chair or a listening center with books and tapes, you can create your special space by finding a company that manufacturers children rugs. Juvenile and kid rugs, also called kid rugs are really activity and learning centers on the floor, where your child can spend time being occupied with age appropriate games and adventures. They are manufactured with not only durability in mind, but also the comfort of the child. They are generally color-fast by being made with a solution dyed yarn which will be able to be cleaned easily with common household cleaners. Kid rugs can involve math problems, alphabet and spelling, games such as tic-tac-toe, road rally adventures, scenic designs, country settings and the like. They are extremely colorful and are specifically designed to hold the attention of pre-schoolers and older children as well. They can be rolled up and stored until used, or left as an area rug and walked on daily. Price is generally determined by the type of material used in the manufacturing process as well as size and design. They are typically bound on the edges (to prevent fraying) and have a backing conducive to the wear and tear you can expect from children using them regularly. 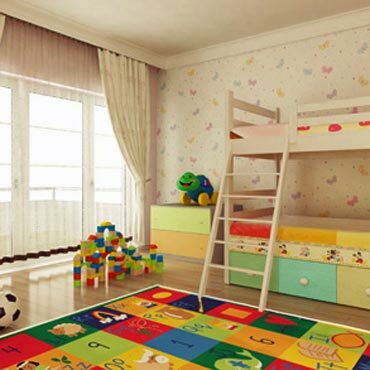 Juvenile and kid rugs can be found in most department stores as well as in fine floorcovering showrooms. They can also be purchased on-line from many reputable web-based companies.